Fill and preheat the SousVide Supreme water oven to 146F/46.5C. Season the chicken with the seasoning mix. Put the seasoned chicken in a single layer into on or more cooking pouch(es) and vacuum seal. Remove the pouch(es) from the water bath and quick chill, submerged in an ice water bath, to make them cool enough to handle easily. Open the pouch and drain accumulated pouch juices (you can add to the chicken broth you’ll use later in the recipe if you like). Transfer the chicken to the work bowl of a food processor, fitted with a plastic blade, and pulse to shred. Add the cream cheese and limejuice to the chicken and pulse to combine. Add the sautéed onion and garlic to the chicken and pulse until well mixed. Transfer to a covered bowl and refrigerate several hours or overnight. In a pot on the stove, bring the chicken broth to a boil. Gradually stir in the flour; stir vigorously and cook for 2 to 3 minutes more. The dough will be stiff. Remove it from the heat to cool, then refrigerate for several hours or overnight. Remove dough and chicken filling from the refrigerator and let them warm briefly. With floured hands, take a golf-ball-sized piece of the dough and roll it into a ball. Press your thumb into the center and make a cavity for the filling. Press a spoonful of the chicken filling (about a heaping tablespoon or 15 ml spoon) into the cavity you’ve created and press the dough closed around the filling. Form the ball into a drumstick shape, dusting hands with flour as needed if sticky, and put onto a baking sheet, pointed end up. Repeat with remaining dough and filling. Put the breadcrumbs into another shallow bowl or pan and season with some salt and pepper. Dip each coxinha into the egg, then roll in the breadcrumbs. 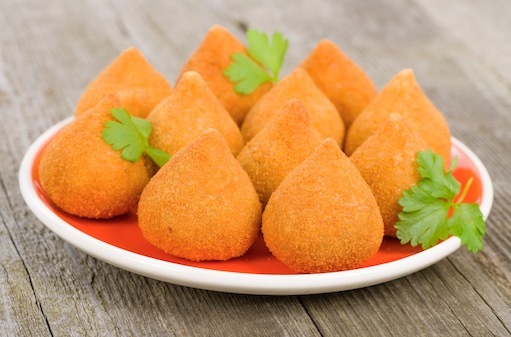 Chill the breaded coxinhas for one hour. When ready to fry, fill a heavy bottomed pot with 2 or 3 inches (5 to 7 cm) of heat stable oil and heat to 360F/80C. Fry the coxinhas in batches, until golden brown. Drain on paper towels and serve hot with Chile Lime Sauce or your favorite dipping sauce!